In his “most accomplished work to date” (Los Angeles Times), master of historical fiction Robert Harris lures readers back in time to the compelling life of Roman Senator Marcus Cicero. The re-creation of a vanished biography written by his household slave and right-hand man, Tiro, Imperium follows Cicero’s extraordinary struggle to attain supreme power in Rome. On a cold November morning, Tiro opens the door to find a terrified, bedraggled stranger begging for help. Once a Sicilian aristocrat, the man was robbed by the corrupt Roman governor, Verres, who is now trying to convict him under false pretenses and sentence him to a violent death. The man claims that only the great senator Marcus Cicero, one of Rome’s most ambitious lawyers and spellbinding orators, can bring him justice in a crooked society manipulated by the villainous governor. But for Cicero, it is a chance to prove himself worthy of absolute power. What follows is one of the most gripping courtroom dramas in history, and the beginning of a quest for political glory by a man who fought his way to the top using only his voice — defeating the most daunting figures in Roman history. This book was a masterpiece. 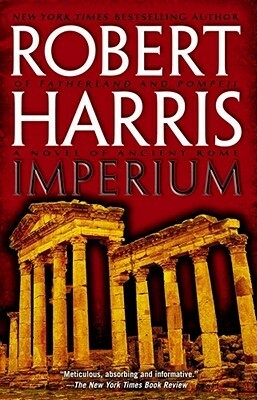 Robert Harris made history fascinating. I, a person whose worst subject in school was history, has fallen in love with historical fiction. This book made me cheer for Cicero from his meager beginnings to the moment he became a consul, a freaking consul. Cicero reached Imperium. The characters were really well built and executed throughout the book. It was a bit like reading a memoir. I think this book would be amazing as a movie. The world needs to see this on screen. This book is so brilliant that I cannot say one bad thing about it. I may be biased because it gives rhetoric and communication high importance, and I am about to obtain a BA in Communication Studies at the end of May. I guess the only thing I “disliked” was the difficulty I had with the names. Apart from Cicero and Tiro, the names are pretty abnormal for this time and age.